the language of the 'great silent places' . . ."
This quote is easier to understand the farther out you go on the park road. It's probably even more true the farther you get from the road. Completely away from the sounds of people and park buses, all you'll hear are the sounds of Mother Nature -- bird songs, marmot chirps, leaves rustling in the wind, water flowing over rocks. <sigh> Makes me want to go on a hike into the wilderness right now. We turned around at Wonder Lake at Mile 85 about 1:30 or 2 PM and began the long drive back to the entrance area. 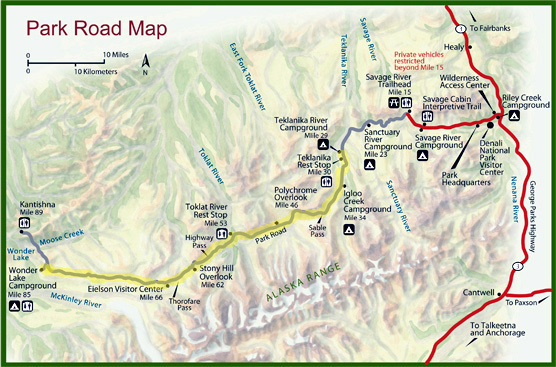 Jim and I were lucky -- we had only 56 miles to go to return to our campsite at Teklanika River, not 84 miles to the Wilderness Access Center at Mile 1 where most of the passengers on our bus began their ride early this morning. 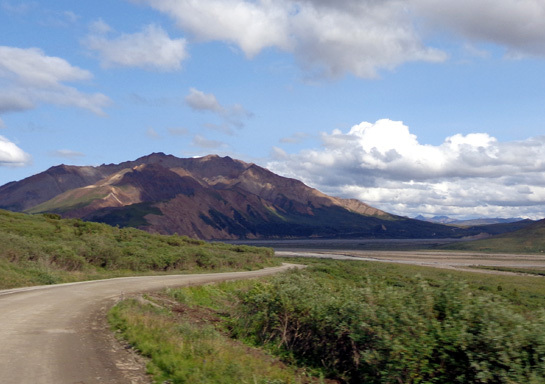 I'll cover the 32 miles going eastbound between Wonder Lake and the Toklat River on this page. I noted in a previous entry that we were able to move to the vacant seat across from ours at the back of the bus on our return trip when the couple occupying that seat got off and stayed longer at Wonder Lake. 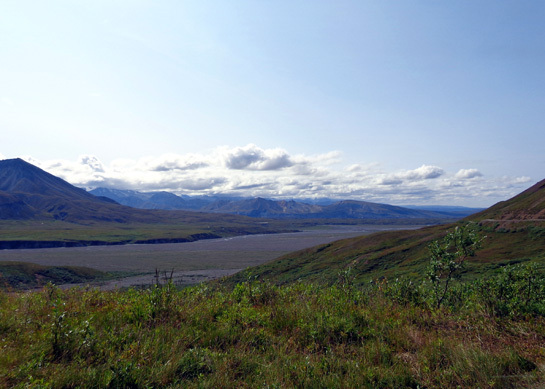 That meant I was still able to take pictures to the south, which I think has the better views along the park road. However, as you'll see in a little while that wasn't always the case on our return trip. 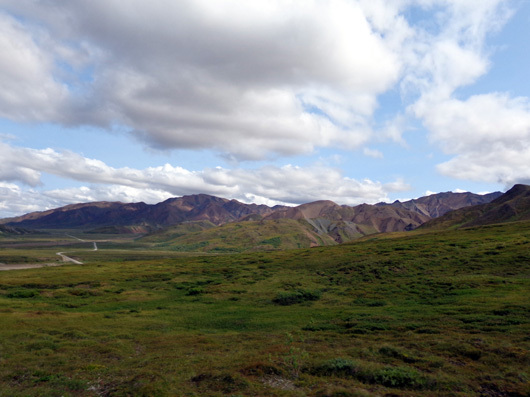 Despite the increasing "disappearance" of Denali under clouds as we traveled east, we saw enough interesting scenery and wildlife to make the return trip almost as memorable as going outbound was. 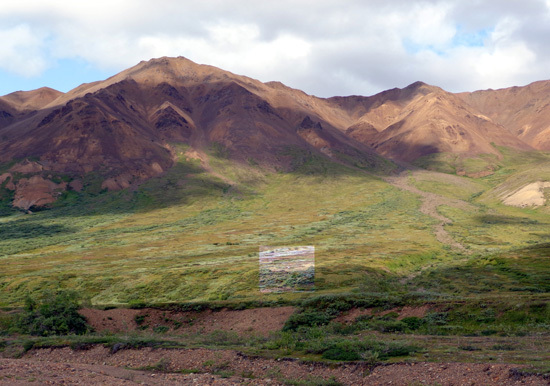 was visible by mid-afternoon on our way back to Eielson. 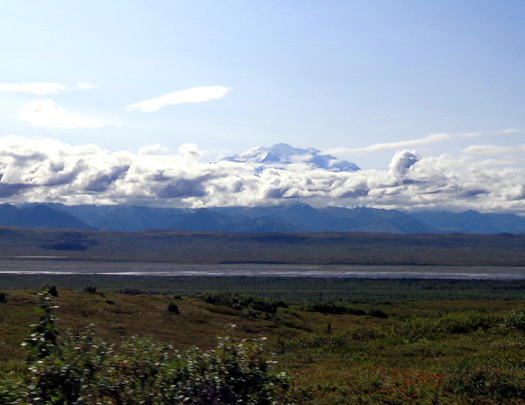 Since we'd already had such magnificent views of Denali in the morning I rationalized that the clouds just gave us a different perspective of the mountains. 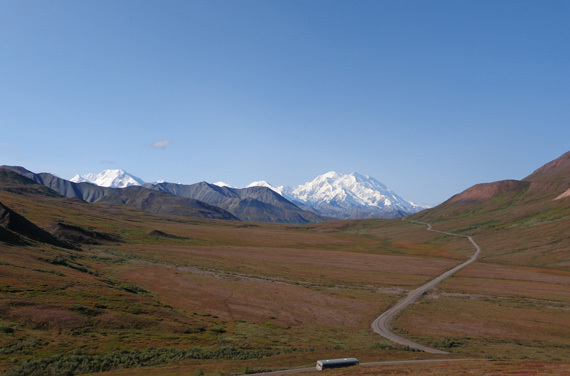 It also made us realize how doggone lucky we were to see Denali at several locations when it was "out" because some people spend days here and never get to see the mountain in all of its glory. I've read that when folks can't see it, some even begin to wonder if it's really there. 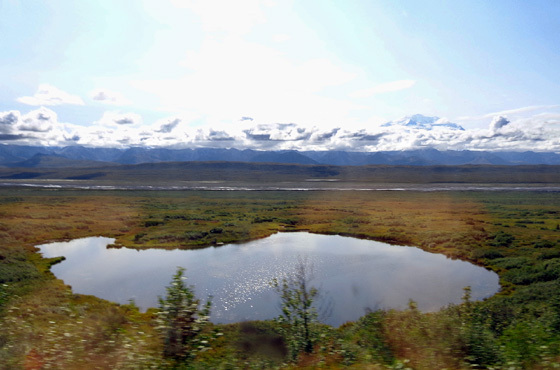 With the increasing clouds obscuring Denali, passengers' attention on our bus became more focused on nearby scenery and the hunt for more wildlife (the passengers who were still awake, that is). 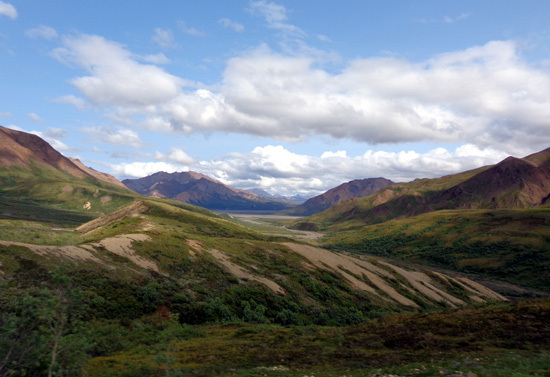 So far Jim and I had seen three grizzly bears but not much else except far-off Dall sheep and some small critters. 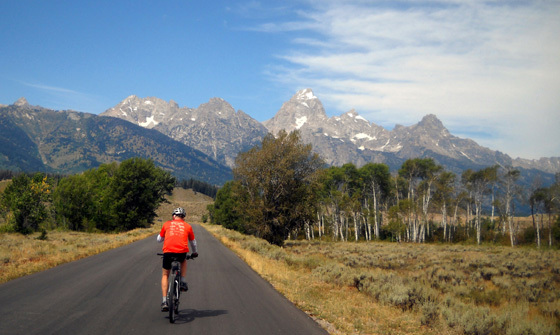 Elevations were mostly above 3,000 feet on our ride today and got up to almost 4,000 feet, so we were in a lot of alpine and sub-alpine terrain. 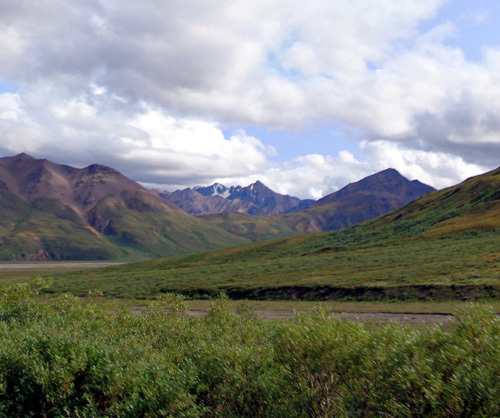 These willows and other shrubs are typical of the sub-alpine terrain through which we traveled. They are a good place for critters to browse -- and hide. Bus drivers are very accommodating to passengers when wildlife is spotted, stopping long enough for everyone to get an opportunity to take photos and watch the animals. No one is allowed off the bus, however. You have to stay inside the bus to take pictures -- and not even hang out the window because that might disturb the critters you're observing or incite one to attack. 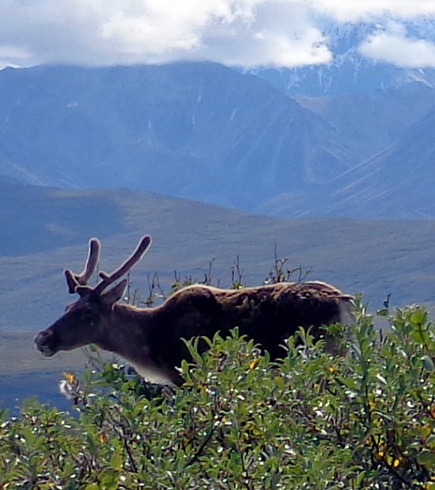 Folks who started at the park entrance also saw a caribou before Jim and I boarded the bus at Tek (Mile 29) this morning. 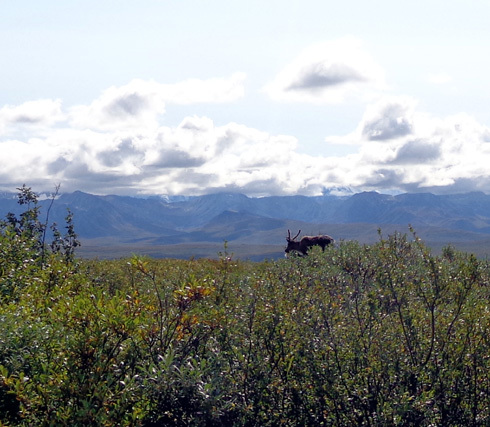 I think that's the only Big Five animals they saw that we missed, unless they saw a bear, moose, caribou, wolf, or more Dall sheep after we got off the bus in the late afternoon. 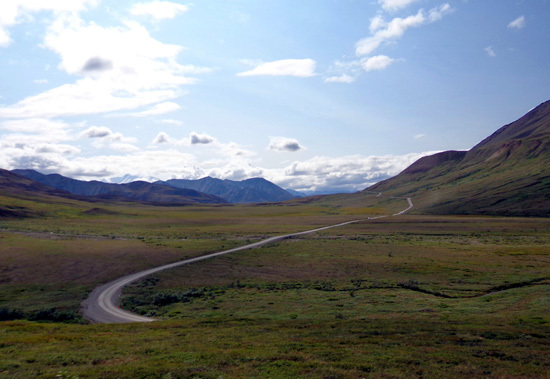 One of the things I�ve read about wildlife at Denali is that many of the animals use the park road as their own personal trail. 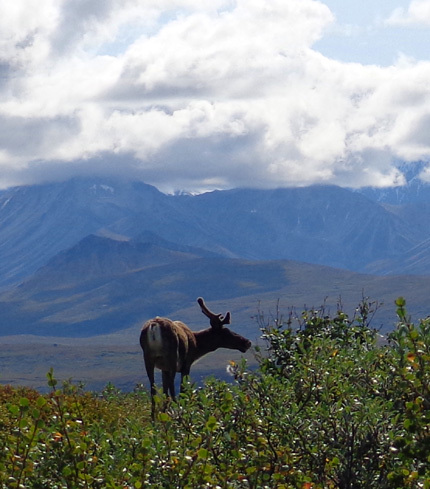 This caribou was the only example we saw of that today. Outbound we stopped here for about 30 minutes; I spent some of that time taking photos of Denali before any clouds formed around it. This time we were there for only about 20 minutes. 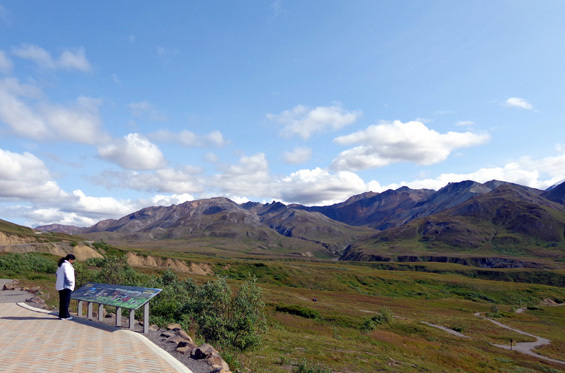 Since Denali was mostly under clouds by 2:30 or 3 PM, I took only a few pictures outside and spent more time inside perusing the exhibits and asking the rangers questions about hiking the alpine trail on the north side of the road. Where did Denali go??? It's so high, it makes its own weather. 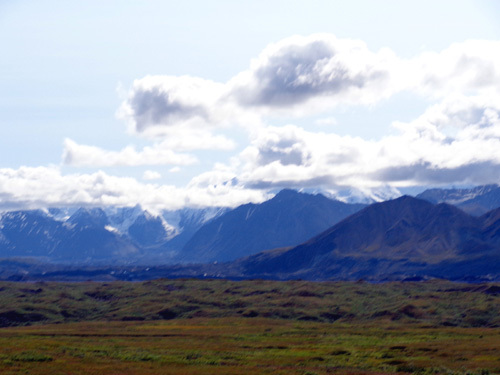 I took this picture at the same spot, but looking southeast where the lower mountains were clear. I was a bit sad when we had to leave the visitor center but there wasn't much point in hanging around today. It was getting too late to hike and catch another bus home so we boarded the same one we'd been riding all day. I'm not even going to bother cropping that one for a close-up! Not only was the mountain totally obscured by clouds, I was also facing the sun in the west. 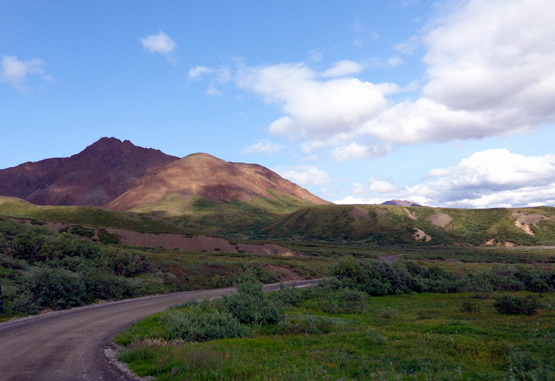 Here are some other scenes I shot as we headed back east from Eielson toward the colorful Polychrome area, where the pink, red, and gold hues were even more vivid in the afternoon light than they were this morning. In addition to the three grizzlies and one caribou I've shown you, we also saw some marmots in rocky areas, squirrels in wooded areas, and ducks on ponds near the road. 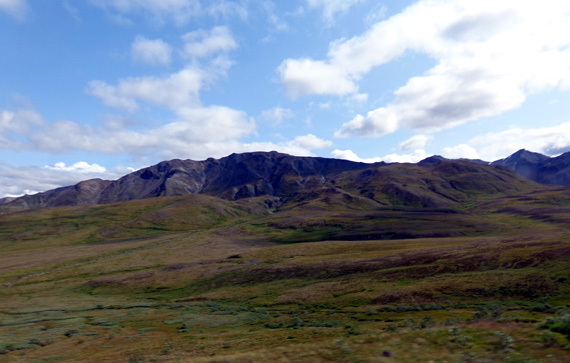 We saw several Dall sheep in the far distance in at least three places today. 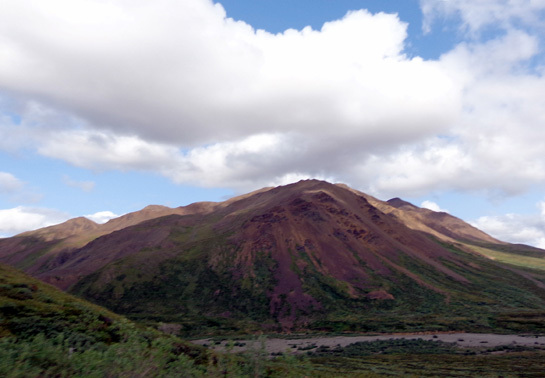 Twice they were on the other side of the bus, high up on mountainsides in rocky areas. When they were on my side I figured they were too far away for my measly 16x zoom to get a good picture so I didn't even try. 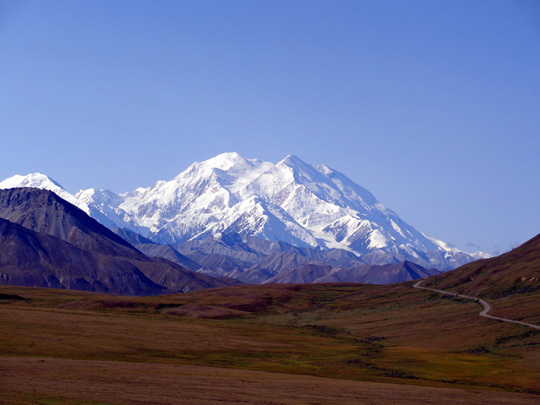 Grizzlies, caribou, Dall sheep -- that made a total of three of the Big Five animals people most want to see at Denali National Park. We didn�t see any moose. That's another one of the Big Five. We expected to see some moose because they are spotted fairly often along the park road but since we�ve seen them many other places in Canada and Alaska on this trip -- and numerous times over the years in our travels in Montana, Wyoming, Colorado, Maine, and other states -- that was OK.
What we didn�t expect to see were any wolves on this bus ride -- that's the last of the Big Five animals -- but we were rewarded with seeing a mama wolf and her pup playing below these colorful hills just west of the Toklat River rest area (highlighted in the photo above). Now get this: There are only about 70 known wolves in this entire six-million-acre park! What are the odds that we'd see two of them so close to the road today?? 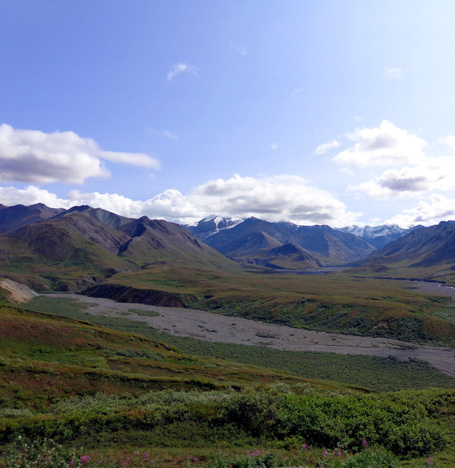 Even though we�ve seen a photo of a pack of wolves walking across the Denali park road, our driver said she�s very seldom seen a wolf in all the years she's worked here. 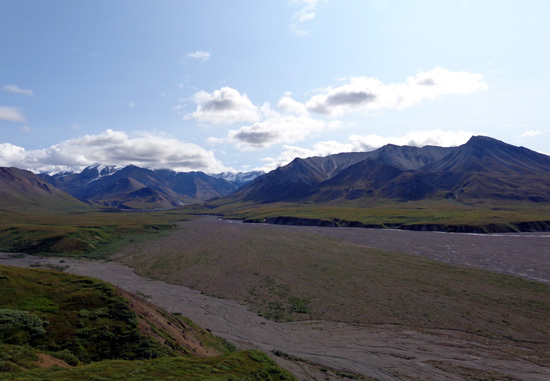 The ranger who gave the campground talk last night at Teklanika River said he hasn�t seen any wolves this summer at all. The wolves were on the north side of the road. Jim and I were sitting on the south side but the back left seat was vacant then (no one took it after we moved at Wonder Lake) and we were able to move over to take pictures and watch the animals in their natural setting. Through our binoculars we could clearly see the mom wagging her tail and playing with the pup. 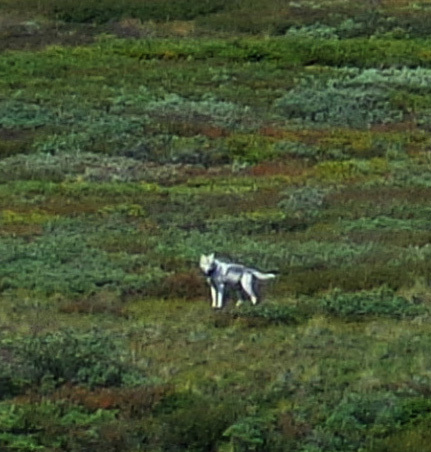 I didn't get a clear picture of the pup because I didn't take any shots with the camera zoomed in on it. It was more fun to watch them play than to fiddle with my camera. Seeing these wolves was one of the highlights of our trip today. Years ago we saw a whole pack of wolves at Yellowstone National Park during the winter when we were cross-country skiing in the backcountry but these were our first Denali wolves and they were special to us -- especially since so few people apparently ever see them. 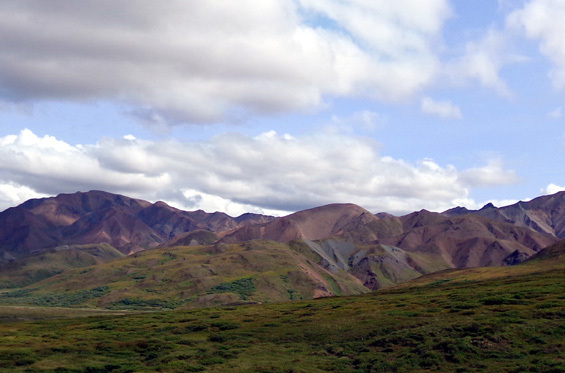 Since I gave up on seeing Denali again this afternoon I didn't mind the clouds floating high over these mountains. I think they added interest to the views.